Six weeks of action packed rugby kicks off this evening with France taking on Argentina in first match of the 2007 Rugby World Cup, in France. I think we're in for a cracking tournament with some fabulous games between the top teams. Unfortunately, we'll have to wait until the knockout stages to see the best of these games, bar the game between South Africa and England on the 14th. I think this will be the best game of the opening rounds. If I were a betting man, I'd put my money on one of the southern hemisphere tri-nations teams. This year's world cup in right in the middle of their domestic season, so in theory all their players should be coming into the tournament match fit. That said, these tournaments are always open to surprises. The talk of the town is New Zealand are entering this tournament as the most prepared team of them all, so lets assume they beat Australia, and naturally SA will beat France ;-) . Guess what we get? Now this would be a stonking match with both teams out to prove something in what would effectively be a repeat of the 1995 RWC final. For those that missed it, South Africa won thanks to a last minute drop goal by Joel Stranski. 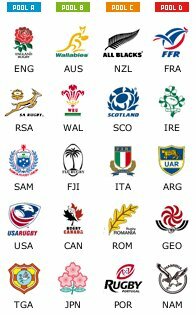 So in summary, I think we're in for a great 6 weeks of rugby. I'll have my bum firmly planted in front of the TV by 7:30 this evening with an ice cold beer in one hand and my bag of biltong in the other. Good luck everyone. May the best team win.